What do you need to decorate a Halloween outfit this year?.... A scary necklace! And this Cloaked Skeleton Pendant is just the thing! 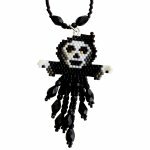 This Cloaked Skeleton pendantbead pattern is made using Japanese Miyuki size 11 Delica beads and brick stitch is used. It is assumed the beader will be familiar with Brick Stitch, however instructions are available for free on www.threadabead.com. Please note the pattern may not work with any other size and type of beads. There are 5 delica colours in total and the finished pendant is approximately 6cm x 4cm. The finished necklace length is 18 inches – but can be made larger or smaller. 18 x 7x5mm Jet Firepolished Drop beads, 27 x 3mm Jet Firepolished Beads, 1 x 4mm silver plated jump ring and 1 x silver plated wire guardian is also required. The bead pattern supplied is12 pages and includes a colour chart of suggested delicas, a colour pattern and a numbered coloured pattern.